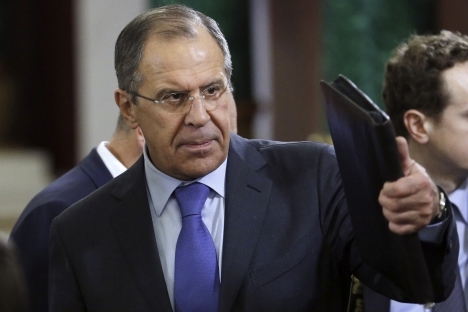 Russian Foreign Minister Sergei Lavrov calls on Israelis and Palestinians not to stop at a cease-fire and to continue looking for ways to put an end to the conflict for good. During the last week's press conference, Russian Foreign Minister Sergei Lavrov discussed the the situation in Gaza Strip with his Bangladeshi counterpart, Dipu Moni. Lavrov also made public that, during the last week of November, a delegation of the Syrian opposition is expected to visit Moscow, including the head of the National Coordination Committee and representatives of the Kurdish opposition, RIA Novosti reported. According to Lavrov, Moscow is ready to facilitate a direct dialogue between Ankara and Damascus, in order to discuss any matters that arise. “We have proposed establishing direct dialogue between Ankara and Damascus… Unfortunately, this proposal has not yet been implemented, but it remains valid. If our help is needed in creating such a mechanism, we will be ready to provide it,” the foreign minister said. The cease-fire between Israeli and Palestinian groups in the Gaza Strip, arranged through American and Egyptian mediation, came into effect on Wednesday evening, Nov. 21. Israel had begun a large-scale military operation code-named Pillar of Cloud in the Gaza Strip on Nov.14, with the express goal of destroying the militants and their infrastructure. Following the cease-fire, Israel suspended Operation Pillar of Cloud, which it had launched in response to intensified rocket fire. The operation involved air attacks against hundreds of targets in the Palestinian enclave. The cease-fire is based on the “truce-for-truce” principle, with Israel reserving the right to resume combat operations (up to a ground invasion of the enclave) if Palestinian attacks were to start again. The Israeli Defense Forces have begun a gradual demobilization of the 56,000 reservists called up for Operation Pillar of Cloud. Avi Dichter, Israel’s minister of home front defense, said on Nov. 22 that Israel had spent $25-30 million to intercept rockets fired from Gaza, using its Iron Dome air defense system during the eight days of conflict. He added, however, that the Iron Dome had proved to be entirely worth the money spent on it. Israel’s air defenses shot down 421 of around 1,500 rockets launched from the Gaza Strip. On the other hand, Western news media reported that, if more rockets had landed on Israel’s territory, a ground operation would have been all but inevitable. It would have cost Tel-Aviv $380 million a day to conduct such an operation. Meanwhile, according to the Al-Jazeera satellite TV channel, 12 rockets launched from the Gaza Strip exploded in the territory of the Jewish state on the night after the truce came into effect. Hamas denied the report, maintaining that the Palestinian side was complying with the cease-fire agreement. First published in Russian in Vzglyad newspaper.